Write about your life and experiences to better understand them and yourself. Journaling is a valuable resource that nurses can use to support their health and wellness. Journaling allows you to script feelings and thoughts to better understand yourself and events, as well as cultivate self-compassion and self-awareness. Writing strengthens cognition, fosters insight, and improves emotional regulation. NURSES’ FOCUS on compassion can be both rewarding and depleting. To offset the fatigue that can come with nursing care, nurses must find ways to express their feelings and tend to their own well-being. Journaling is a valuable resource that nurses can use to support their health and wellness. Using journaling to script feelings and thoughts promotes understanding, self-compassion, and self-awareness. In addition, writing strengthens cognition, fosters insight, and improves emotional regulation. Although the benefits of journaling are well established, it’s underused as a method for self-care and reflection. Philosopher and educational reformer John Dewey wrote that “reflective thinking alone is educative.” Journaling provides a foundation for reflective thinking and can help anyone, including nurses, express their emotions and improve their health and well-being. At its most basic, journaling is a record of personal thoughts, daily events, and evolving insights. It also provides a foundation for creativity, guidance, selfawareness, understanding, and spiritual development. While journaling, authors can express themselves without censorship, disapproval, or judgment. Screaming, expressing anger, whimpering, feeling sad, wailing, and raging may occur while journaling. Research also shows that journaling is an important tool for developing critical-thinking skills. Nurses use journaling to explore “general observations, questions, speculative statements, expressions of self-awareness, statements of synthesis, revisions of previously held ideas, and the accumulation of new information to develop critical thinking…” as noted in a 2017 article by Dimitroff and colleagues. Scheffer and Rubenfeld defined reflection as “contemplation upon a subject, especially one’s assumptions and thinking, for the purposes of deeper understanding and self-evaluation.” And Raterink found that journaling was valuable in the clinical setting when used by graduate nursing students. As the students became more comfortable with journaling and self-reflection, they felt more competent about their critical-thinking skills and habits. Use these suggestions to get started with your journaling. Medium—Choose the medium you would like to use. Some people prefer paper and pen or pencil, while others journal on their computer or laptop. Another option is a cell phone app. Date entries—Dating entries will give you a timeline and historical perspective. Choose when—Decide how many days a week you would like to journal and make time in your schedule. You may consider journaling for 15 to 30 minutes each day. Shared or private—Do you want to share your journal or keep it private? Your journal is about you, and you get to decide whether you share it. After you decide, ensure your journal is easily accessible for writing. Decide what to write about—You will need to decide what to write about in your journal. This article highlights the benefits of writing about feelings and experiences for the purpose of reflecting on them. So, you may consider writing a narrative about an experience and detailing what happened as well as describing your thoughts and feelings about the situation. Freewriting—Freewriting is unstructured, without concern for spelling, grammar, introductions, conclusions, or outlines. It allows you to write without judgment. When we need our writing to be perfect, being creative and free-flowing with our thoughts is difficult. In freewriting, you start with a sentence such as, “Today I am beginning my journal entry. I am going to write about what happened at work yesterday…” and then start writing whatever comes to mind. Remember, you can always go back and edit later. Reflection—After you complete a journal entry, reflect on what you have written and your insights about the experience. Ask yourself: What was my response? What went well? What would I do differently next time? Who do I want to be in the future? How will I become that person? 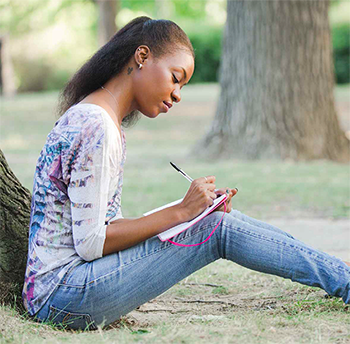 Journaling provides an opportunity to express emotions and gain self-awareness. It also is a proven way to gain perspective and achieve a higher level of health and wellness, which benefits nurses directly and, in turn, all of the people whose lives we touch. Lynda J. Dimitroff is an educational and leadership consultant in Rochester, New York. Adams K. Expressive Writing: Foundations of Practice. Lanham, MD: Rowman & Littlefield Education; 2013. Brady EM, Sky HZ. Journal writing among older learners. Educ Gerontol. 2003;29(2):151-63. Burtson PL, Stichler JF. Nursing work environment and nurse caring: Relationship among motivational factors. J Adv Nurs. 2010;66(8):1819-31. Dewey J. How We Think. Mineola, NY: Dover Publications, Inc.; 1997. Dimitroff LJ, Sliwoski L, O’Brien S, Nichols LW. Change your life through journaling—The benefits of journaling for registered nurses. J Nurs Educ Pract. 2017;7(2): 90-8. Field V, Bolton G, Thompson K. Writing Works: A Resource Handbook for Therapeutic Writing Workshops and Activities. London: Jessica Kingsley Publishers; 2006. Francis ME, Pennebaker JW. Putting stress into words: The impact of writing on physiological, absentee, and self-reported emotional wellbeing measures. Am J Health Promot. 1992;6(4):280-7. Hiemstra R. Uses and benefits of journal writing. New Directions for Adult and Continuing Education. 2001;90:19-26. Hinderer KA, VonRueden KT, Friedmann E, et al. Burnout, compassion fatigue, compassion satisfaction, and secondary traumatic stress in trauma nurses. J Trauma Nurs. 2014;21(4):160-9. Keidel GC. Burnout and compassion fatigue among hospice caregivers. Am J Hosp Palliat Care. 2002;19(3):200-5. Kuo CL, Turton M, Cheng SF, Lee-Hsieh J. Using clinical caring journaling: Nursing student and instructor experiences. J Nurs Res. 2011; 19(2):141-9. Lepianka JE. Using reflective journaling to improve the orientation of graduate nurses. J Contin Educ Nurs. 2014;45(8):342-3. Parr G, Haberstroh S, Kottler J. Interactive journal writing as adjunct in group work. The Journal for Specialists in Group Work. 2000; 25(3):229-42. Pennebaker JW. Opening Up. The Healing Power of Expressing Emotions. New York: The Guildford Press; 1990. Pennebaker JW, Colder M, Sharp LK. Accelerating the coping process. J Pers Soc Psychol. 1990;58(3):528-37. Raterink G. Reflective journaling for critical thinking development in advanced practice registered nurse students. J Nurs Educ. 2016;55(2):101-4. Sacco TL, Ciurzynski SM, Harvey ME, Ingersoll GL. Compassion satisfaction and compassion fatigue among critical care nurses. Crit Care Nurse. 2015;35(4):32-43. Scheffer BK, Rubenfeld MG. A consensus statement on critical thinking in nursing. J Nurs Educ. 2000;39(8):352-9. Smart D, English A, James J, et al. Compassion fatigue and satisfaction: A cross-sectional survey among US healthcare workers. Nurs Health Sci. 2014;16(1):3-10. Stamm BH. The ProQOL Manual. Idaho State University: Sidran Press; 2005. Waldo N, Hermanns M. Journaling unlocks fears in clinical practice. RN. 2009;72(5):26-31. Zori S. Teaching critical thinking using reflective journaling in a nursing fellowship program. J Contin Educ Nurs. 2016;47(7):321-9. I think journaling is a very useful tool—as long as it does not include actual descriptions of actual events with actual patients. Keep in mind that journaling about adverse events poses a potential risk to nurses. In a deposition nurses will be asked if they have any logs, journals, or diaries and if so, they can be discoverable and will need to be produced. There will always be something in that journal that can be a statement against that nurse’s interest. Additionally, nurses will be asked if they keep this kind of detailed log on every patient they take care of. The answer is no, so the next obvious question is why they did so in this case. It is difficult to overcome presumption that the reason the nurse made a detailed log in this case is because something happened that should not have. It also makes the nurse less credible when under oath he or she testifies to not remembering some details about the case when being asked about it in what can be years after the event. There are also potential problems with HIPAA, state privacy laws, violation of organizational policies, and professional misconduct charges. I always advise nurses to NOT keep journals, logs, or diaries about patient events, much less copies of documents like incident reports or medical records for just these reasons. Journaling about feelings and one’s personal journeys can be helpful. Just remember that journaling about feelings is one thing—memorializing adverse events is another. Note: This information is not intended to provide legal counsel. In reading my November issue of American Nurse Today I found an article on journaling. While attending a workshop given by a nurse/attorney we were told never to journal anything about your job as this can be “discoverable” in any future litigation. The article in this issue promotes journaling about work experiences. I wonder what would be the response from a nurse/attorney on this practice. Is there one on staff of this publication who could comment?